The rich dark cocoa flavor of these cut-out cookies sets them apart as one of the yummiest cookies I’ve ever had!! This weekend was a special treat — my good friend (and fellow baker/blogger) Megan came to visit me from Pennsylvania. 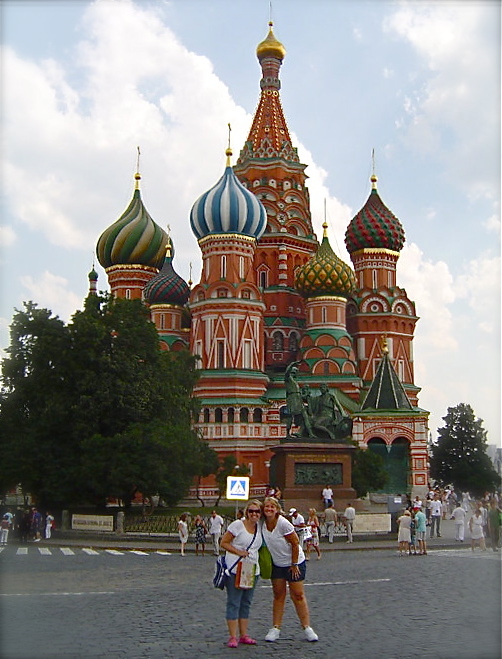 We met in 2010 on a mission trip to Russia and we have been best of friends ever since. Megan and her mom and sisters create the most beautiful and unique cakes I’ve ever seen, and they blog about life and caking on their blog Happily Ever Cakes. Megan has such great decorating ideas and she promised to share some of her recipes and techniques with me this weekend. We spent hours in the kitchen (often accompanied with friends who wanted to help and learn too!) It was so much fun, and I’m so excited to share with you all the things I learned!! 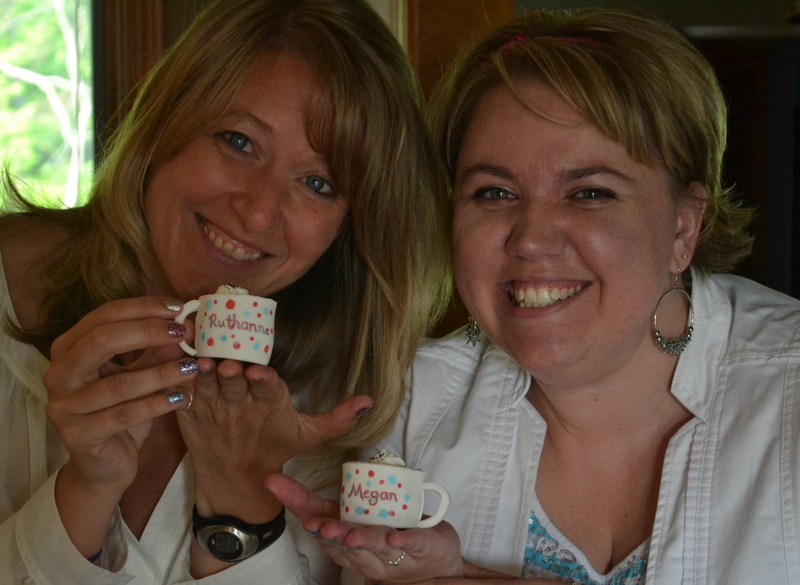 Holding our personalized mug cupcakes–technique coming soon to Easybaked! I wasn’t sure which project to tell you about first, so I decided to begin by dedicating this post to some truly yummy chocolate cut-out cookies. They are cute. Super super cute cookies. But 24 cookies took three of us about 3 hours….which means if I’d done them alone they would have taken me 9 hours….yeah. So there are a lot of pictures because this will likely never happen again. We even put some of them on lollipop sticks which was a really fun way to display them. When Megan suggested a royal icing project I immediately thought of this great family recipe. I’d never made them as a cut-out cookie or attempted to bake them with sticks inserted, but I thought it would be worth experimenting with since they taste SO good. The verdict?? 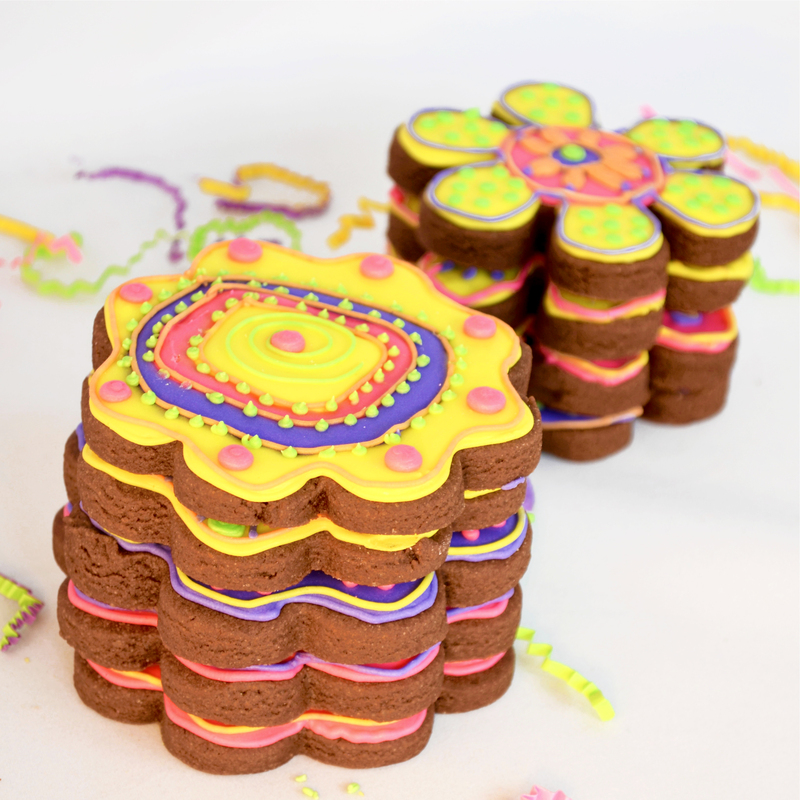 These dense chocolate cookies are easy to cut into shapes and worked great with or without lollipop sticks. 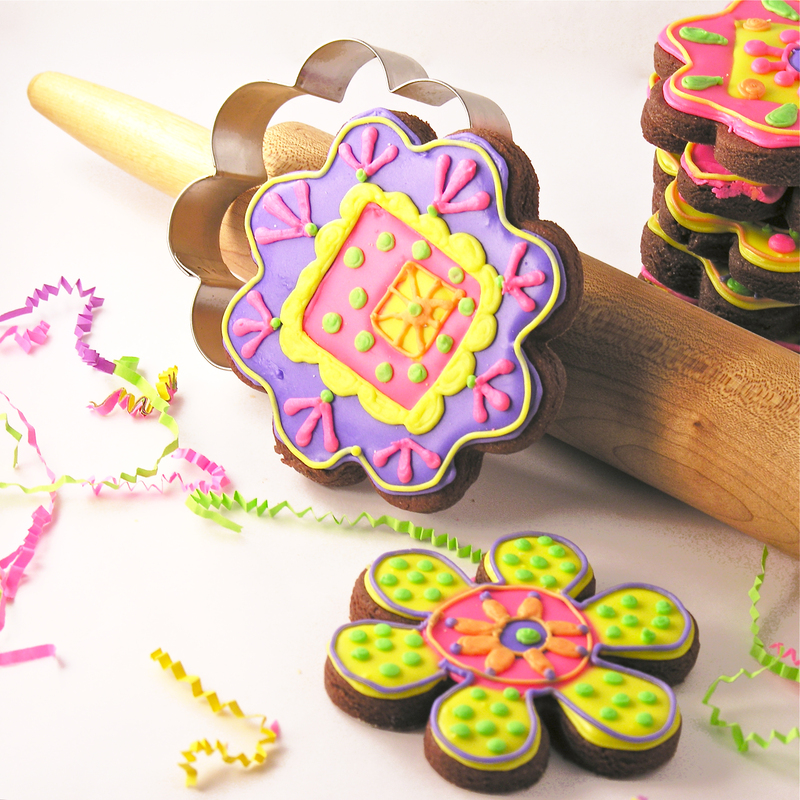 The dark cookie really made all the fun colors in our frosting stand out too! Wrap in plastic and chill for at least one hour. 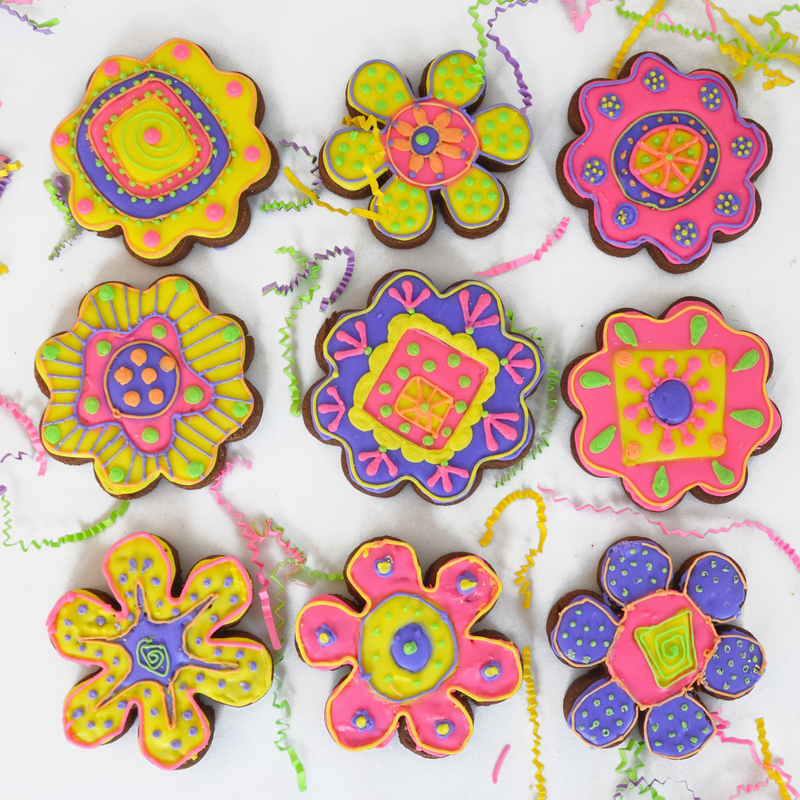 Cut into desired shapes and place on a parchment-lined baking sheet. 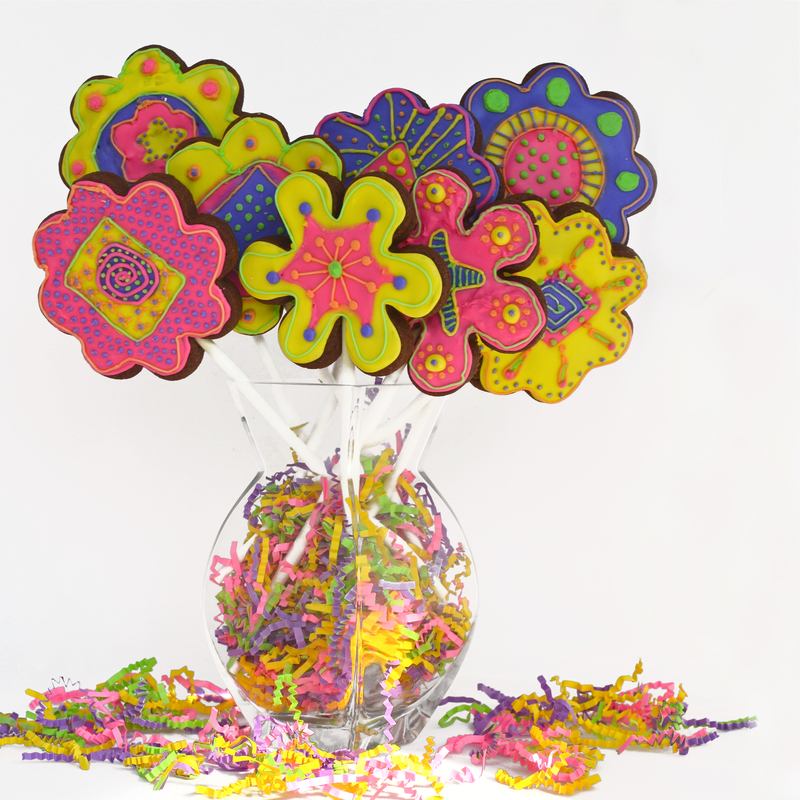 Insert lollipop sticks, if desired, by gently pushing stick into cookie about 1- 1 1/2 inches. You will need to arrange cookies to fit with sticks on top of cookie sheet. Gently slide parchment paper off of cookie sheet and onto a flat surface. Cool completely before moving- this allows the cookie to “set” around the stick. Even when it is cooled, handle it with care. It takes a little time for the cookie to harden around the stick. Frost as desired. A simple powdered sugar glaze will be delicious on these, or if you want to get fancy (and have a nice hard surface on your cookie) click here for Megan’s royal icing recipe and instructions for use. Posted in Cookies and tagged baking, chocolate, chocolate cookies, chocolate cut-out cookies, cocoa, cookie pops, cut-out cookies, dark cocoa, fun cookies, icing gels, lollipop sticks, party favors, recipe, royal icing, sugar. Bookmark the permalink. You’re so sweet– thank you! 🙂 I wish I was that artistic, the patterns are so ‘me’ aswell! Wow, those cookies are so beautiful, you are both so talented. I save Megan’s recipe for royal icing, I could never do anything so intricate but wish I could. How nice that you two were able to spend time together. Thats so funny– I’m always on the look out for fun food photo stuff– I have a big storage tub full of accessories 🙂 Great minds DO think alike!! WOW, 24 cookies – 9 hours for one person. Amazing. There is so much detail on them though. I can see that. What beautiful cookies. So glad we got to spend time together. I had lots of fun baking with you!!!! I’m glad you let me talk you into try royal icing again. I had so much fun too Meg– and I love how these turned out- who knows…if I keep doing it maybe I will actually like royal icing one day…? 😉 Thanks for all the great tips!! I love the funky colours!